In case you need to evacuate this hurricane season or prepare for any disaster, here is a list of documents you should bring with you. 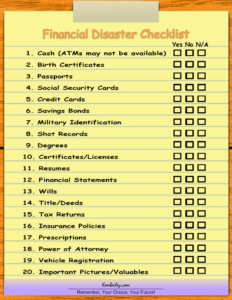 This checklist includes key financial documents such as tax returns, titles, deeds, insurance policies, and other essential items. Also, keep in mind the list also includes non-financial items such as resumes, licenses, transcripts and other items just in case you need to search for a job or transition to a new location. Click on the image for a printable copy. You are so cool! I don’t believe I have read through anything like that before. So wonderful to discover someone with unique thoughts on this topic. Seriously.. thank you for starting this up. This site is something that is required on the internet, someone with a bit of originality! Thanks Kemberly! 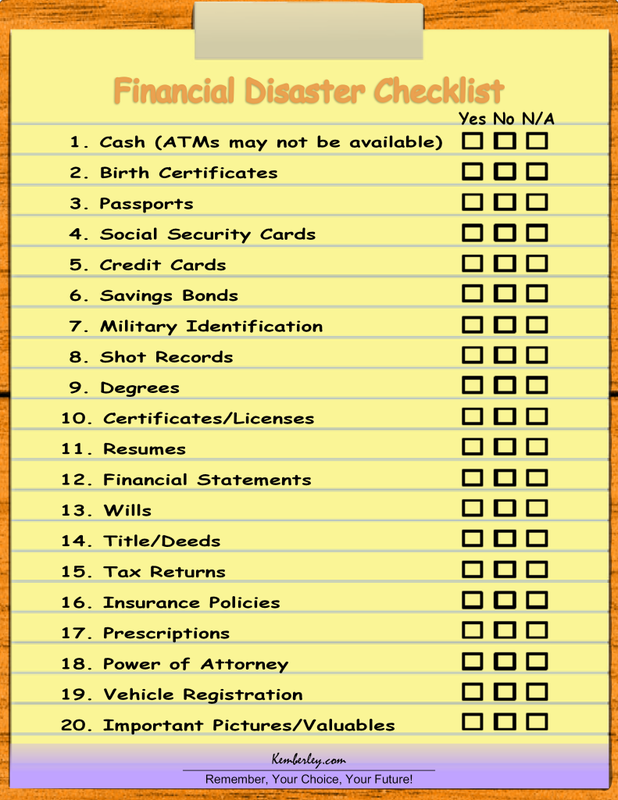 Thankfully I have most of it in one place – now I need to add your checklist to make sure it all gets accounted for in the event of evacuation. Last year we had tornadoes, earthquake, hurricane and fire. Oh yippee. Thankfully we were okay in our end of town. P.S. Found your list in LinkedIn (AICPA Women), although I’m using my WordPress account to leave this note. Thanks for your response. I am working on another checklist that I am finding quite useful. After experiencing Hurricane Katrina, it is my hope to help others! This is the 2nd posting, of yours I checked out. Kemberly, Thank you for such outstanding work and reaching out to the community. Everyone’s involvement helps. Run your finances like a small business!